Summer’s here, and millions of people will be boarding planes to sunny beaches and 11am cocktails. If they feel vaguely guilty about the environmental cost of their trip, they are probably thinking about the flight, and not about the endless stream of selfies they will post on social media to prove just how fabulous a time they’re having. In fact though, our collective social media addiction (and video streaming habit) is as bad for the environment as our holiday flights. The data centres that store and process our every online move require a stupendous amount of energy, creating a carbon footprint as big as the airline industry’s. Modern information technology heavily relies on magnetic data storage, where information is encoded in the magnetic state of a material. To read and write the data, current technology uses a magnetic field generated by electric currents. This set-up entails a double loss of energy: the electromagnets dissipate energy in the form of heat, and then guzzle energy for cooling. Energy efficiency would be enormously improved if we could replace the magnetic field by a low-energy electric field. This would amount to controlling magnetisation by an electric field, however, and that is not a straightforward affair. It requires a strong coupling between a material’s magnetisation and its electric polarisation. There are theoretical reasons why such materials are extremely rare, and then there are experimental challenges to preserving the relevant properties under conditions that are not too extreme. Work on multiferroic magnetic spirals by MARVEL’s Nicola Spaldin’s and Marisa Medarde’s groups could point to a way around these obstacles. In a series of papers they unravel the mechanism that stabilises multiferroic magnetic spiral order in the layered perovskite YBaFeCuO5 up to room temperature, and show that it is mediated by chemical disorder. The two researchers are unanimous in stressing the importance of the theory/experiment collaboration made possible by MARVEL. “I can’t emphasise enough the necessity of theory/experiment collaboration for making progress — illustrated again by this extremely fruitful collaboration.” Spaldin says. “From my side, I have to say that it would not have been possible to get the nice understanding of the spiral origin and control mechanism that we have now without the collaboration with Nicola.” Medarde adds. Cutting up the outcome — (i) multiferroic (ii) magnetic spirals (iii) stabilised by chemical disorder — we get a step-by-step guide to the back and forth between theory and experiment that has brought us closer to being able to control magnetisation by an electric field. Multiferroics. Named in analogy to the way iron becomes magnetic below its Curie temperature, ferroic materials exhibit a spontaneous long range ordering, which can be switched by the conjugate field. Thus, in ferromagnetics the electron spins align to yield a spontaneous magnetisation, which can be switched by an applied magnetic field. Analogously, in ferroelectrics the electric dipole moments align to yield a spontaneous electric polarisation, which can be switched by an applied electric field. 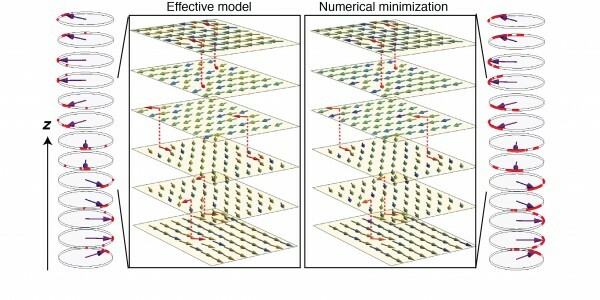 Multiferroics are materials that combine at least two ferroic orderings (by convention, specifically, ferroelectricity and (ferro)magnetism) in a single phase. Crucially, when two types of ferroic ordering appear together, a cross-coupling may happen, such that the respective orderings can be manipulated by each other’s conjugate field. In such multiferroics, magnetisation can be manipulated by an electric field, and vice versa. As we saw, this so-called magnetoelectric effect holds great promise for data storage applications. Multiferroics aren’t the only materials to exhibit the magnetoelectric effect, but — by their very definition — they are obvious candidates. Magnetic spirals. To find realistic multiferroics, then, we need to identify alternative mechanisms such that magnetism and ferroelectricity might coexist. Magnetic spirals are one such mechanism. The trick here is that the magnetic spiral structure amounts to a non-centrosymmetric magnetic ordering, which causes (long range) polarisation, even if the atomic structure itself is centrosymmetric. Thus, with magnetic spirals, the ferroelectricity doesn’t have an independent origin but arises from the magnetic structure itself. Because of this, the coupling between the material’s magnetic and ferroelectric properties is intrinsically much stronger — which is a good thing for applications. Not so good for applications is the fact that spiral magnetic order typically only persists at temperatures below 100K, which is way below normal device operating conditions. One notable exception is the layered perovskite YBaCuFeO5, which displays switchable magnetism-driven electric polarisation at unexpectedly high temperatures and over a relatively large temperature range. That doesn’t make YBaCuFeO5 ready to use in a device quite yet: we first need to learn how to stabilise and manipulate the magnetic spirals. To this end, Medarde and her experimental group at PSI teamed up with Spaldin’s theoretical group at ETHZ to develop a model for the magnetic spiral phase in YBaCuFeO5. Figure 1. (a) Structure of YBaCuFeO5. (b) Unfrustrated magnetic order in the commensurate phase. Chemical disorder. What they found was a completely new mechanism for stabilising magnetic spirals. Magnetic spirals are the result of magnetic frustration, when crystals are organised in such a way as to make it impossible to align all the spins parallel or antiparallel. In spiral magnets, the frustration typically arises from the competition between nearest-neighbour and next-nearest-neighbour magnetic exchanges of comparable strength. (This is also the reason magnetic spirals tend to have low ordering temperatures.) However, combining measurements and calculations, Medarde’s and Spaldin’s teams concluded that such interactions were unlikely to explain the spiral order for YBaCuFeO5. Instead, they found that chemical disorder plays a crucial role in stabilising the spiral magnetic order. The structure of YBaCuFeO5 is shown in Fig. 1. 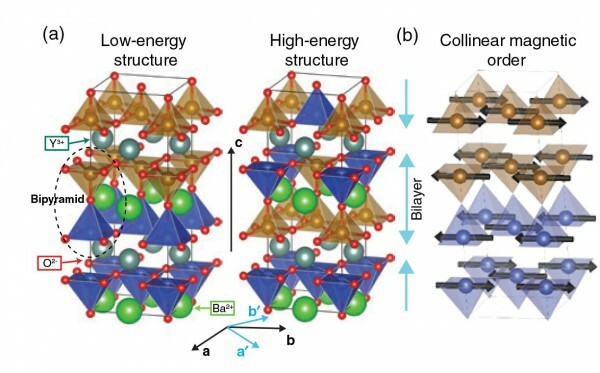 YBaCuFeO5 features layers of Ba ions, with Fe/Cu bipyramids sandwiched in between. The bipyramids are occupied by equal amounts of Fe3+ and Cu2+ ions, but their distribution can vary. “The distribution of the Fe and Cu ions immediately stood out as a key effect, determining the period, orientation, and onset temperature of the magnetic spiral,” Medarde says. Consequently, they speculated that they might be able to tune the properties of the spiral phase by manipulating the degree of Fe/Cu disorder. The researchers at PSI went on to show that this can be done indeed. “Our expectation was that preparation method could make a big difference to the amount of disorder,” Medarde explains. “The difference between the Fe3+ and Cu2+ ionic radii is relatively small, so during preparation Fe3+ ions can easily slip into sites that were ‘reserved’ for Cu2+ ions, and vice versa. Faster cooling freezes more of that disorder into place.” Thus, using different cooling rates the researchers managed to manipulate Fe/Cu disorder. As small changes in the amount of disorder have a big impact on the degree of magnetic frustration, this allowed them to very precisely tune the properties of the magnetic spiral. Most impressively, using very fast cooling rates resulting in high disorder, they managed to extend the stability range of the spiral beyond room temperature. Meanwhile, the researchers at ETHZ developed a theoretical model to explain those results. The scenario is this. In YBaCuFeO5, the lowest energy state is one in which all bipyramids are Fe-Cu pairs (Fig. 1a). In this configuration, the magnetic interactions are unfrustrated, so no spiral will form. However, during preparation occupational disorder can be introduced, resulting in local defects in the form of Fe-Fe and Cu-Cu bipyramids (Fig. 1b). The Fe-Fe bonds introduce strongly frustrating magnetic couplings. Using Monte Carlo simulations and electronic structure calculations on a simple lattice model, Spaldin’s team shows that this frustration results in a magnetic spiral. Moreover, they hint at how the nature of that spiral permits coupling between the magnetic order and the electric polarisation, allowing one to be manipulated by the other.